I feel as if I haven’t done ANYTHING! What have I done to creat memories for my family? Did I send out all the Christmas cards? I haven’t done any shopping! Christmas is just 4 days AWAY!!! This comes from a Homily given by Deacon Harold Burke-Sivers (Diocese of Portland, Oregon) on EWTN Daily Mass, 06Dec 2011. A mother is a Monstrance. 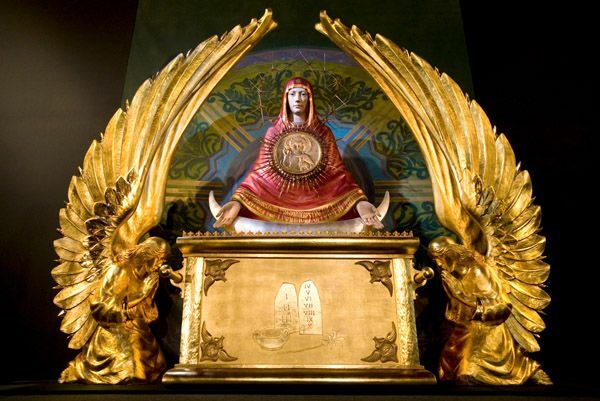 Mary was the first Monstrance. Okay, so this was to be the end of the Post. No such luck! I am searching for an image to use for this post and found the one below. Sometimes the sites are very interesting, therefore, I, with pleasure, use the image! Other times, the sites have other images that I judge as inappropriate – I wouldn’t want MY Kids to see them and I should not be seeing them either, as Spiritually, I am not at that level – and do not use them. Other times, I come across sites that make me uncomfortable, or they challenge me, or are just plain interesting, and I use their images as well. In this case, I would recommend you read this. But I digress, Mr. Floyd makes very valid points. He had me all the way to the end. Of the Comments, I mean. It was there that I became jarred. You see, God is So FUNNY!! He truly enjoys teasing and connecting or leaving dots lying around so that we can connect them to TRY and get at the bigger picture. This past Sunday, Father Mario spoke about the Immaculate Conception, I know, 10 days too late!! But he did it. Here you will find his Homily. What Father warned about was a Veneration towards Mary that was Unbalanced. He spoke about, much like Mr. Floyd, how our Protestant Brothers and Sisters see our Honouring Her as Adoration, or taking away from God. He further clarified how Mary IS the Mother of God! An issue with our Protestant Brothers and Sisters…and I may be WAY off, but it seems that even with Mr. Floyd…but Don’t take MY word for it! Please go and come to your own conclusions! Mr. Floyd has some very interesting Posts!! Camille, make sure you tell me HOW!!! Oh and I LOVE how I’m thinking about Your Driving In Reverse, and THAT is the name of your Post!! Can you please be LESS Cryptic and just spell it out for me, PLEASE!!! I’m just along for the ride – that’s how! Well, and as I did this morning I tend to spend a lot of time ranting and dumping all my problems on Him… he’s got big shoulders afterall. It doesn’t often take him long to send in his reinforcements (as he did this morning… and this afternoon… and likely tonight) – but first I have to hand it over!